On a preliminary research trip for Beyond Digital, Jace Clayton found a particularly beautiful album of contemporary Berber music at a hijab-and-music stand Casablanca’s medina. This June Beyond Digital was able to contact Imanaren’s bandleader, Hassan Wargui. Wargui is from the Berber village of Issafen in south Morocco, but he moved to Casablanca for work. We clicked, and he ended up joining in the project. Beyond Digital, Wargui, and his musicians wrote music and filmed video shorts together, even traveling 10 hours south to Wargui’s home village to visit and record. This embrace of sustained, grassroots collaboration lies at the heart of Beyond Digital. In September 2011, Beyond Digital members Maggie Schmitt, Juan Alcon Duran, and Clayton returned to Morocco stage a free outdoor concert in Tangier with Hassan and Clayton’s ensemble Nettle. Here’s our writeup on the Tangier project. In early 2012, Beyond Digital helped Wargui make his Imanaren album available worldwide on iTunes, Amazon, and other platforms. In spring 2013, Wargui, Nettle, Schmitt, and Alcon, along with several Moroccan artists, will return to Issafen for further collaboration. This project is currently supported by the Arab Fund for Arts and Culture. Here is the information sheet on Imanaren’s debut album (PDF). 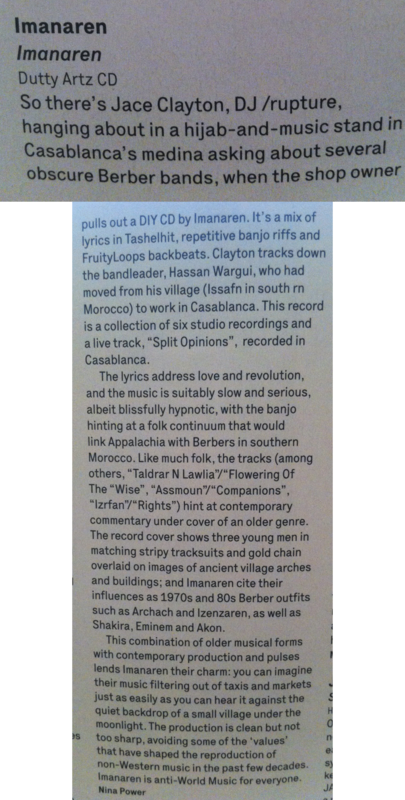 Here is Nina Power’s review of the Imanaren album, published in U.K. music magazine The Wire. In addition to the Morocco plans, further collaborations between Imanaren and Clayton’s band Nettle hope to create touring opportunities for them in Europe and America. For more information on Beyond Digital’s extended collaboration with Hassan Wargui, please read Clayton and Schmitt’s essay in The Fader.